Dental implants offer a permanent solution to tooth loss. They’re a great option for patients who do not want to both with removable prosthetics like dentures. 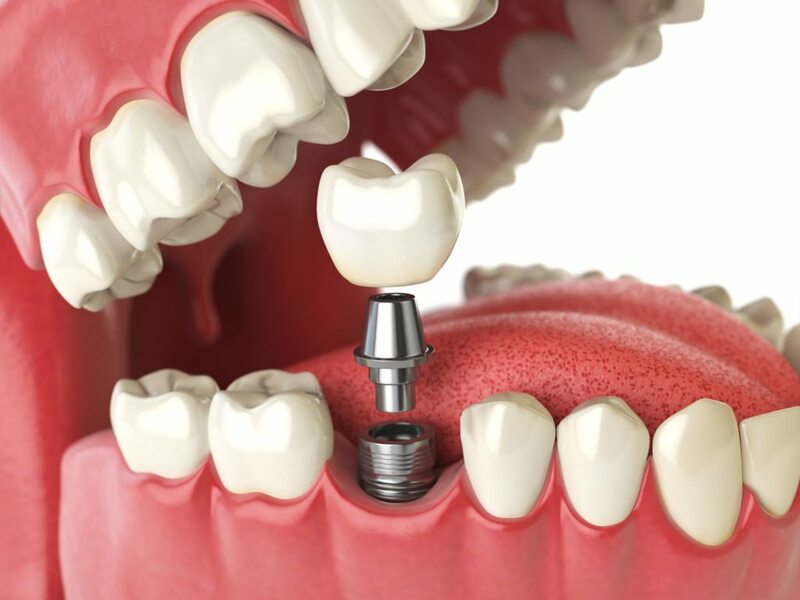 Dental implants are metal posts that are implanted into your jaw bone and affixed with a permanent crown. Dental implants work by securing a metal post into your jaw bone. A crown is then created to attach to the post for a permanent dental prosthetic. The procedure of getting dental implants occurs throughout several visits over a period of several months. This is because of the healing required for the bone before you can move on to the next step of the procedure. In stage one, you come in for a consultation with the doctor to review your option. They will take an impression of your mouth, do a complete examination, take x-rays, and may even order a CT scan to get a complete picture of what your jaw’s condition is. If you’re deemed a candidate for the surgery you will come in and have the first step completed, which is to remove or graft bone and insert the metal rods. This procedure is performed under general anesthesia and requires you have someone to come and pick you up and drop you off. The second stage of the procedure is performed once the bone has healed and the rods are firmly in place. Crowns will be created to look and function like your teeth and are attached to the rods to create a fully functioning mouth. Dental implant appear natural, and while the road to getting them can be long, the majority of people agree they’re worth it. With implants, you never have to worry about removing them or having to take special care of them. They function and look just like your natural teeth. Dental implants are cared for just like your normal teeth. You need to brush regularly – twice a day, go in for cleanings every six months, and floss once a day. It’s also crucial that your diet consists of healthy, whole foods because sugar can still lead to decay of your gums, bones, and remaining teeth. The best way to know if you’re a candidate for dental implants is to schedule an appointment with Dr. Quartano. The ideal candidate will be in good health, as this makes recovering from surgery much easier. Additionally, any issues that have caused decay and tooth loss, like periodontitis, will have been addressed before the start of surgery. Performing any surgery while there is an active infection can put the patient in danger of the infection spreading. Contact Dr. Quartano today to learn more about dental implants could solve your tooth loss problems and give you the radiant smile you’ve always wanted. Whether you need one implant or several, these permanent prosthetics have improved the quality of life and self-esteem of patients nationwide.